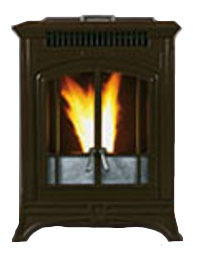 The Country Collection Bella pellet stove is an elegant cast iron stove almost 'Georgian' in appearance by the makers of the Whitfield pellet stove. It has a large hopper for long burn times. Window Size 15" by 17"
The Country Collection Bella pellet stove has the ability to burn a 50% mix of corn and wood pellets. Designed with quietness in mind, the combustion fan sits in insulated mounts to stop transmitted noise, and the convection fan can be turned down as it operates independently of the combustion rate. The burn pot and its air holes should be cleaned after burning 200lbs. of pellets. The ash pans should be emptied after burning 400lbs. of pellets. The heat exchanger should be cleaned once a week using the built in scrapers. The flue passageways in the stove should be cleaned after burning 1,000lbs. of pellets. The combustion blower, convection blower, air intakes and the proof of fire switch should be cleaned after burning 2,000lbs. of pellets. The rear stove compartment should be cleaned once a year, the door and window gaskets inspected, and the flue checked and cleaned if necessary. If you would like to leave a review of the Country Collection Bella pellet stove, please use the form on the contact page.